In followup of yesterday’s post on the struggle of the Democratic leadership to revamp their party by coming up with a new slogan, Chuck Schumer has an op-ed in The New York Times on The Better Deal. As I quoted Nancy Pelosi in saying yesterday, this “is not a course correction, but it’s a presentation correction.” Democrats who turned out to willingly vote for Hillary Clinton in 2016 will be pleased, but only a major course direction will satisfy those of us who did not. This offers little to win back the votes of those of us who did not vote Democratic in 2016. That includes those of us who voted third party, and the even larger numbers who crossed over and voted for Trump over Clinton or stayed home. These proposals leave the Democrats as a party which stands for nothing. At least they didn’t mention Russia. Unfortunately this also didn’t really discuss health care. It is like trying to steal Bernie Sanders’ agenda while ignoring Medicare-for-all or actually getting big money influence out of politics. Beyond this, the problem comes down to thinking they can substitute a new slogan for real policies or ideas. They hardly inspire confidence when the principles of one election, to the limited degree they express any, are ignored in the next. Running on social issues alone was not enough (especially when led by a socially conservative presidential candidate), but that does not mean they should ignore liberal social issues now. Those of us who voted Democratic because of outrage over policies of George W. Bush are hardly going to be enthusiastic about a party which nominated a candidate who supported the worst abuses under Bush–neoconservative interventionism, restrictions on civil liberties, and increased government secrecy. Nor is there any offer to reform the undemocratic nomination rules which make the mockery out of the primary process, making it little different than picking the nominee in the old smoked filled rooms. The new slogan has been received with considerable derision. Jonathan Allen compares the new Democratic slogan, “A Better Deal: Better Skills, Better Jobs, Better Wages” to the pitch from Papa John’s, “Better Ingredients. 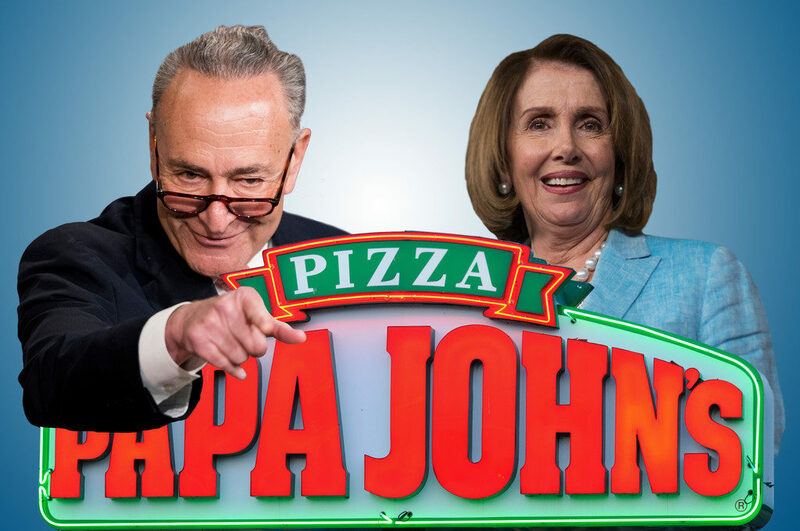 Better Pizza.” Except the Democrats failed to add better ingredients. Not having Clinton on the ballot should help Democrats pick up seats in 2018, but it is likely to be a dead cat bounce, and perhaps more limited than Democrats hope, if the Democrats do not come up with more of a reason to attract voters than opposing Trump. It might be best if the Democrats could get out of the way and allow a new party to take over as a the true opposition and resistance. Posted in Bernie Sanders, Civil Liberties, Democrats, Donald Trump, Economy, Foreign Policy & National Security, George Bush, Hillary Clinton, Politics, Polls, Social Issues. Tags: Bernie Sanders, Chuck Schumer, Civil Liberties, Donald Trump, George Bush, Health Care Policy, Health Care Reform, Hillary Clinton, Iraq, Libya, Nancy Pelosi, Russia, Social Issues, Syria. RSS feed for comments on this post.. TrackBack URL. "Presentation correction" is indeed all it is. I did the DemExit long ago. Nothing to attract me back with this.